I’ve walked past Le Garrick hundreds of times. It’s on Garrick street, literally two minutes from Covent Garden station – en route to the piazza. Yet I never quite realised how awesome it would be/was inside. The exterior, a dark green parisian bistro look, doesn’t catch the eye as much as it should among all the bustle in West Central. It really doesn’t do Le Garrick justice. The interior is pretty cute, super romantic, with a stripped back, minimalist feel. Think Brick walls, dark wood tables, candles donning each and every table setting. More than half of the restaurant is downstairs in the basement and I couldn’t believe how big it was! The service was next level too which really added to the experience. We were given a warm welcome on arrival and we were seated armed with the daily specials. Our waitress smiled at my feeble attempt at naming some of the menu items, and she regularly checked in throughout our meal. She was like this with every table in close proximity which is always a great sign! On to the most important part. The food. The menu is traditional french. Think Escargots de Bourgogne, Boeuf Bourguignon, and Confit de canard et ses haricots lingots (Classic honey glazed duck ‘confit’ with green beans). Th choice isn’t overly extensive, but there’s more than enough to get you hung up on what to pick. The dishes sounded delicious, so much so that Chris and I both had about four dishes in our shortlist for which we wanted to try. 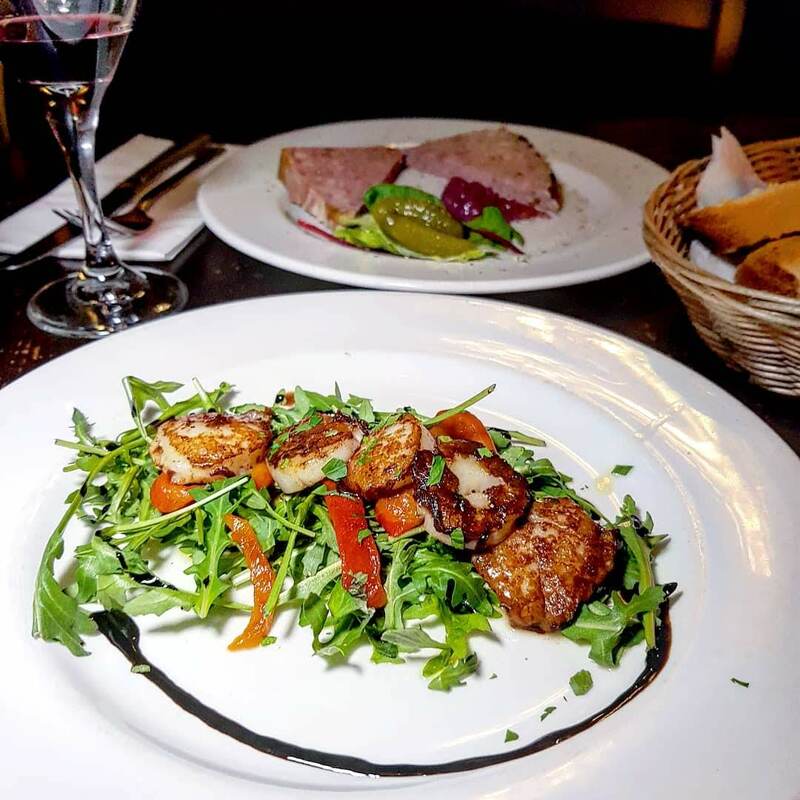 The Noix de St Jacques (Scallops), arrived with a fresh rocket and pepper salad with balsamic drizzle. The scallops themselves tasted slightly smoky, barbecued. They were small, and pretty juicy. Overall a pretty good light starter. The Pâté de campagne maison was our favourite starter however. Smooth, rich, delicious the pate was served with freshly baked crunchy bread. Although the bread was a little overdone, we would definitely recommend this one. On to the mains, and we soon realised that the portions were more than generous. The dish of the day was a duck breast with mash and greens. The duck, ordered medium rare, was beautiful in flavour and just as tender as the chicken. It had a fantastic rich sauce. The mash was creamy and the greens just wilted, making one fab dish. It’s safe to say I had the biggest food envy! Knowing french cuisine doesn’t have as much green as I’d like, we also ordered the petit pois Grand-Mère. A big dish of petit pois with bacon and onions, it was just what was needed to make our dinner complete. They were cooked beautifully, and the bacon and onions added a fab flavour. The dessert menu is small and concise, yet there are some really tasty options. 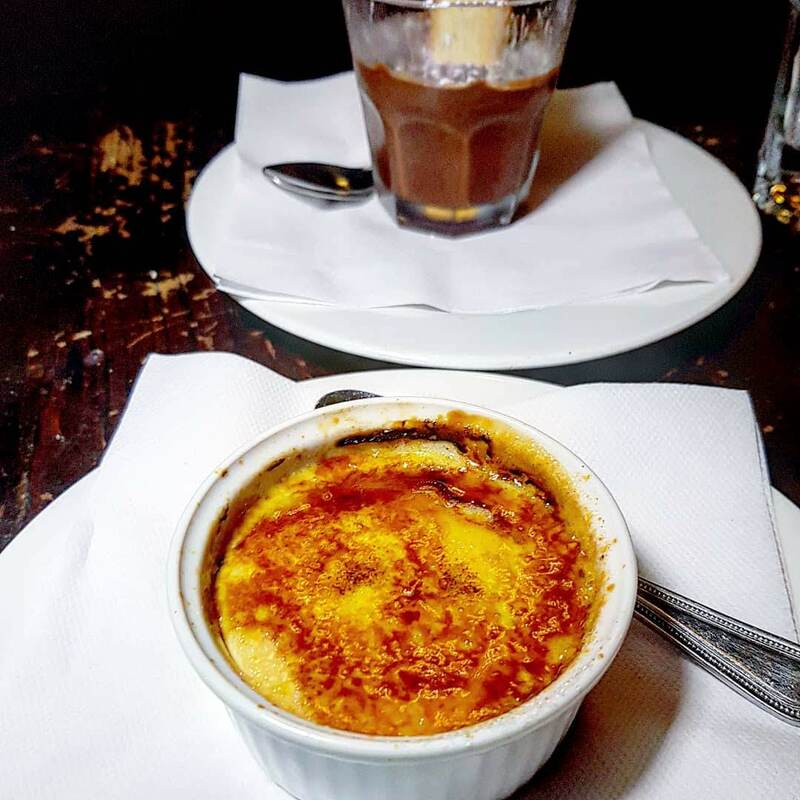 The Crème brulée was creamy and indulgent with a superb crispy top. A fab one if I do say so myself. It was the perfect portion too to finish our french feast. 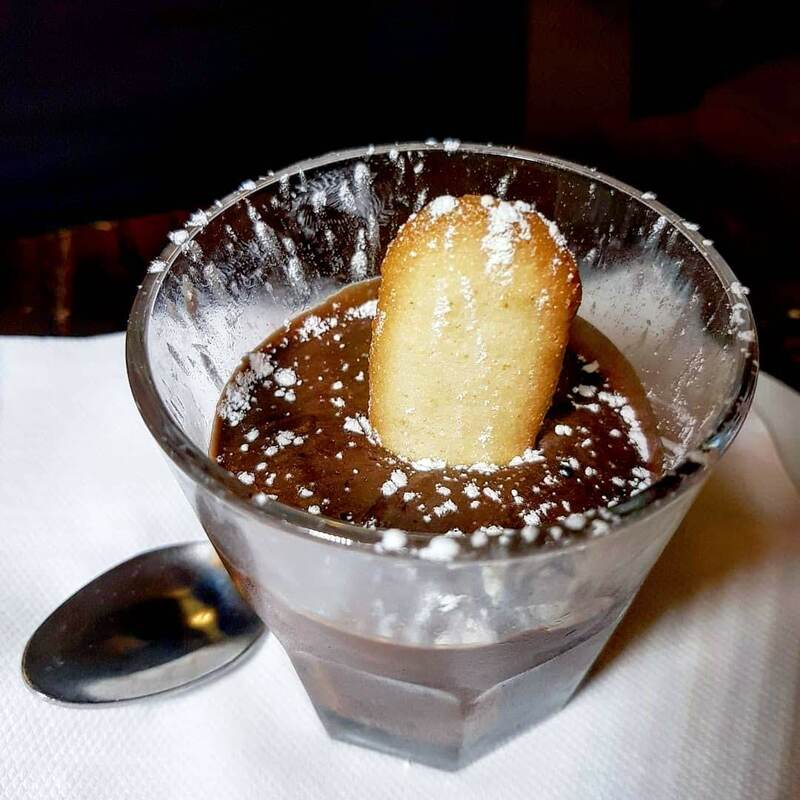 The Petit pot au chocolat (Chris nearly ordered chocolate peas haha), was a rich, thick mousse style dessert. It was mouth-wateringly good. Both fantastic choices. And to accompany our dishes…wine of course. 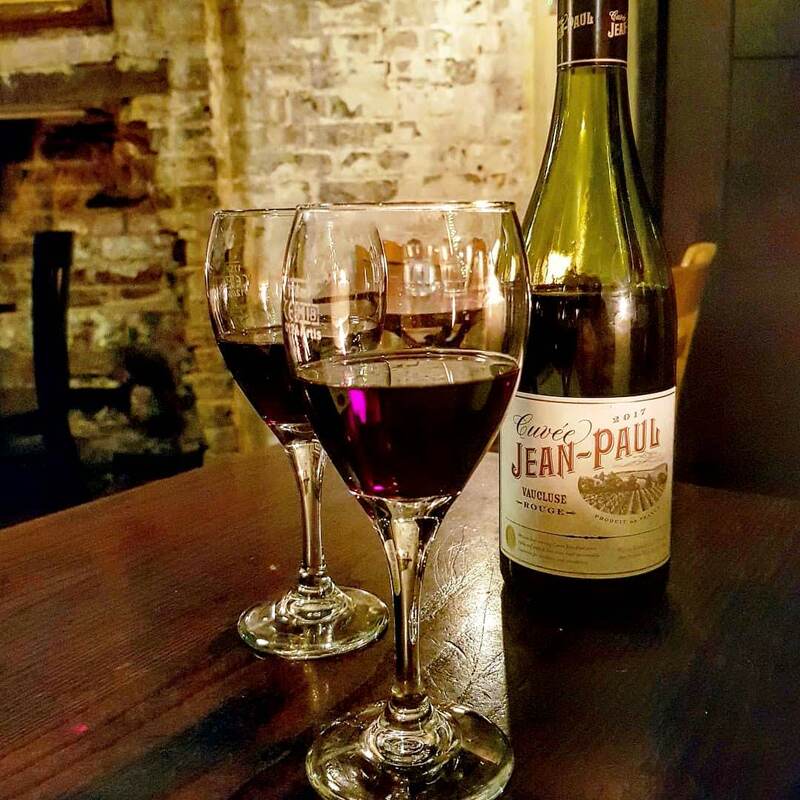 We couldn’t resist a bottle of the house red. Deep, rich and beautiful, it was medium-bodied and pretty smooth. White might have suited some of our dishes a little better, but this was a great wine to drink alongside. We do love a red! We had such a good meal in this cute, romantic spot. The wine might have fuelled the giggles, but it was one truly lovely evening. A fab little spot if you’re thinking about heading out for dinner this Valentine’s Day, or for an upcoming date night. 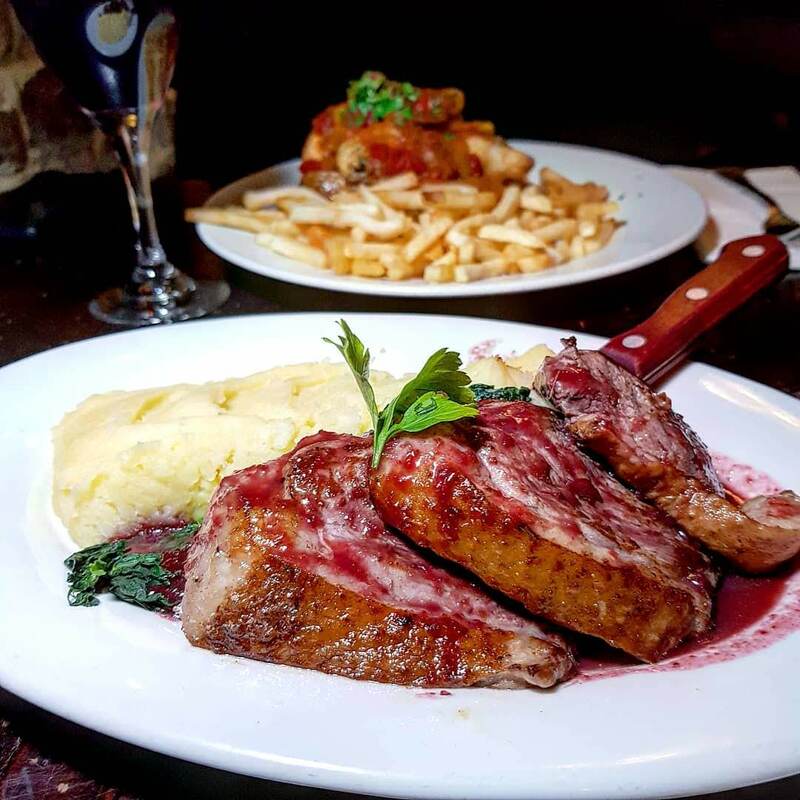 Price: Starters between £6 and £9, mains between £12.95 and £27.95 (rib eye). Pretty reasonable for Covent Garden. 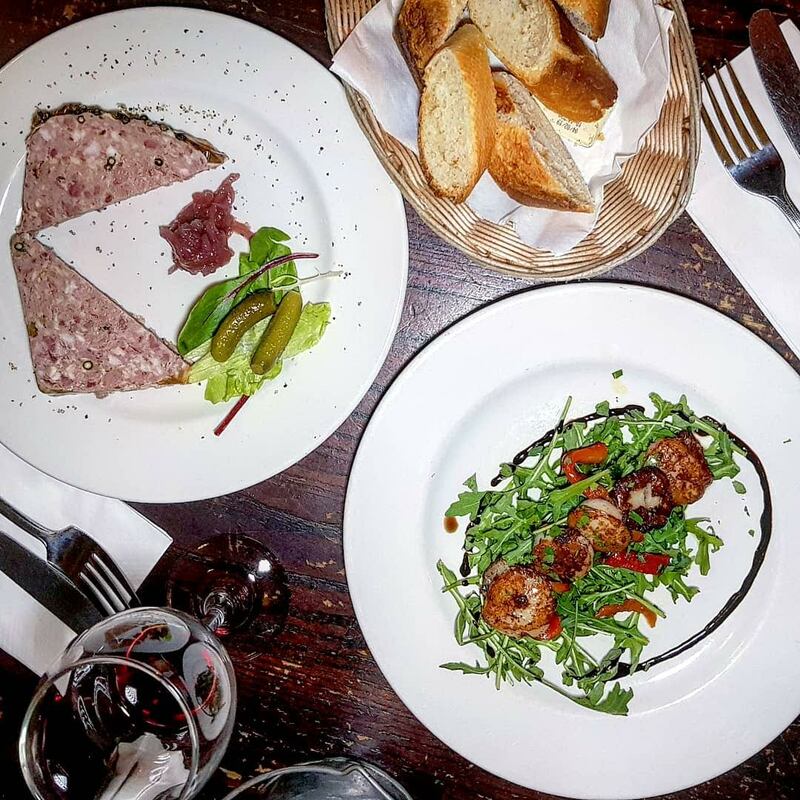 Food: Delicious french cuisine. Not an overly extensive menu, but you still get stumped. Go for the pate and the duck. You can’t go wrong with the desserts! Drinks: There are plenty of options. 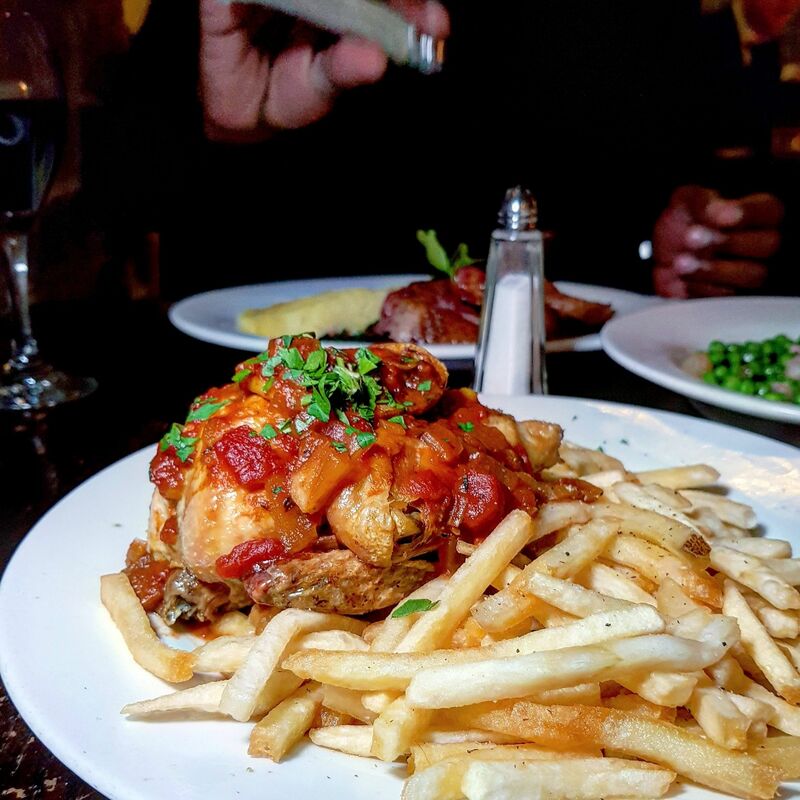 The house red is a beautiful accompaniment to dinner. Wait: Do book, especially if you’re thinking about heading there this Valentine’s Day. What romantic spots have you been to? 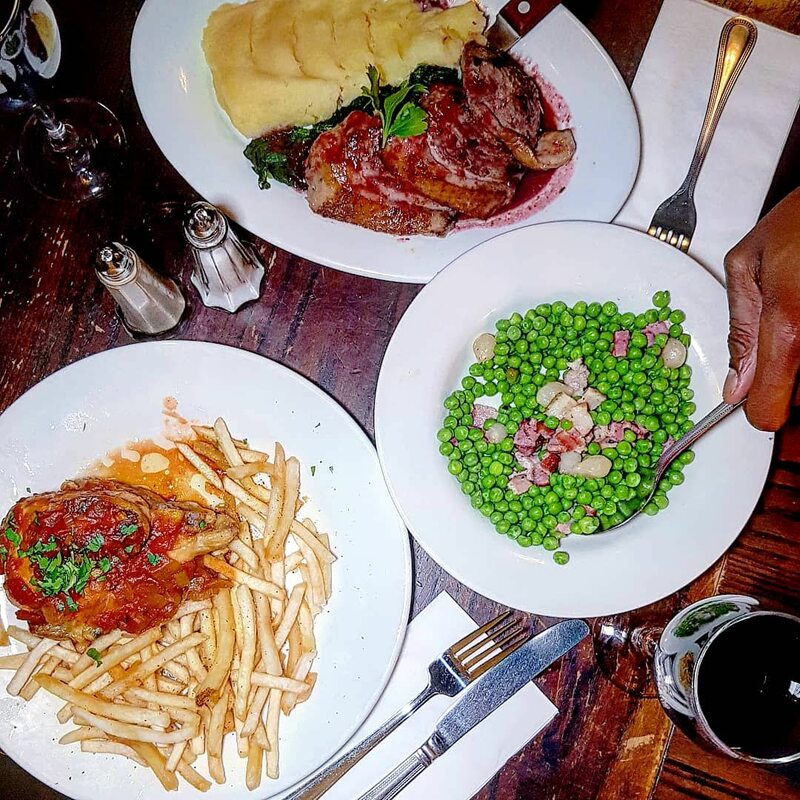 * I was invited along to review Le Garrick. All views my own.